We have talked about the Great Pyramid of Giza, and how the massive structure has baffled historians throughout the ages by not only its size but also its abstruse purpose. But as it turns out, in ancient times, pyramids were not only limited to the African continent – as is evident from the still existing Pyramid of Cestius. Presumed to be built between 18 and 12 BC, the structure (situated along the Via Ostiensis) was erected during the reign of the famed Augustus. As for its size, the monument being certainly dwarfed by the Egyptian pyramids, is still substantially imposing – with a square base of 29.5 m (around 97 ft) on all sides, and a height of 36.4 m (around 120 ft). Now, in terms of structural bearing, the Pyramid of Cestius is too steep and more pointed when compared to its Egyptian counterparts. This may have demonstrated the Roman engineering prowess (or mistake), with the pointed nature being possible due to the use of concrete as the core building material (curtained by bricks and the clad with Luni marble). However in spite of this dimensional ‘mismatch’, the construction of the Roman pyramid might have been influenced by its African counterparts. In historical terms, Egypt was already absorbed as one of the provinces of Rome by 30 BC. But arguably more interesting is the Roman military expedition to Kushite territory (northern Sudan) in 23 BC. That is because the steeper facade ratios of the Pyramid of Cestius is more akin to the Nubian pyramids designed by the Kingdom of Kush – and such extant structures may have played their influencing roles. Quite intriguingly, the Roman architecture of the time was already propelled by the ‘Egyptian’ phase, with obelisks cropping up in many parts of the city. Some of the structures were even ‘shipped’ from Ancient Egypt – like the 25.5 m (84 ft) high obelisk in St. Peter’s Square which was probably constructed way back in 13th century BC. 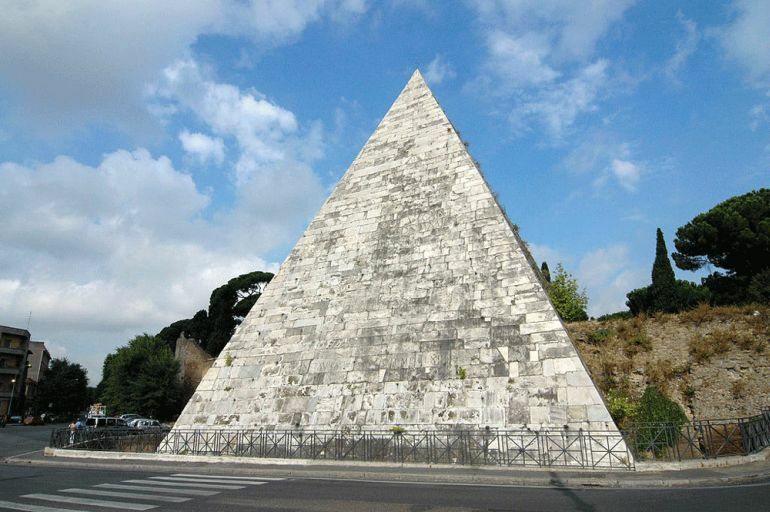 Furthermore, there was a larger pyramid built inside Rome, known as the ‘Pyramid of Romulus’. 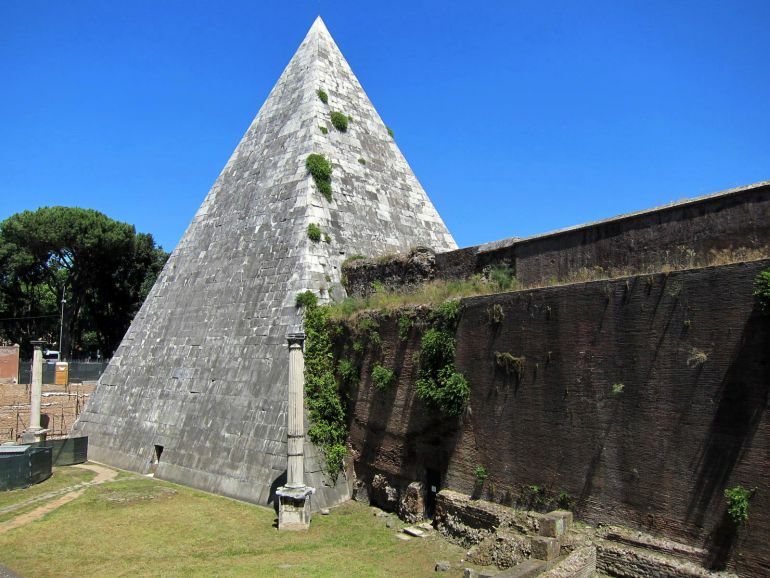 In fact, during the medieval times, the Pyramid of Cestius was known as the ‘Pyramid of Remus’, and both of the monuments were believed to be the mausoleums of Rome’s legendary founders. Unfortunately, the craze for Egyptian structures had largely subsided during this epoch. So, in an unfortunate event of state-sponsored vandalism, the ‘Pyramid of Romulus’ was stripped down, and its marbles were used for the stairs of St. Peter’s Basilica (much like the Roman Pantheon components being used for the ‘baldacchino’). As we can make out (from the second line of the inscription), the pyramid was completed in just 330 days. For comparison’s sake, the Great Pyramid at Giza was constructed over a time of 20 years. And interestingly, all of these details were rediscovered in the 1600s when tunnel builders found the Roman pyramid intact in its place. 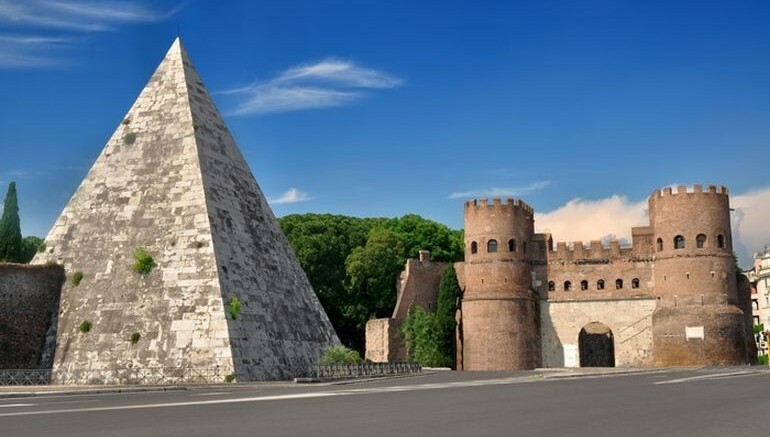 It should be also be noted that the Pyramid of Cestius was already structurally connected to the fortifications of the Aurelian walls (a task achieved between 271 and 275 AD) – an architectural decision that might have played its crucial role in maintaining the monument over the centuries. 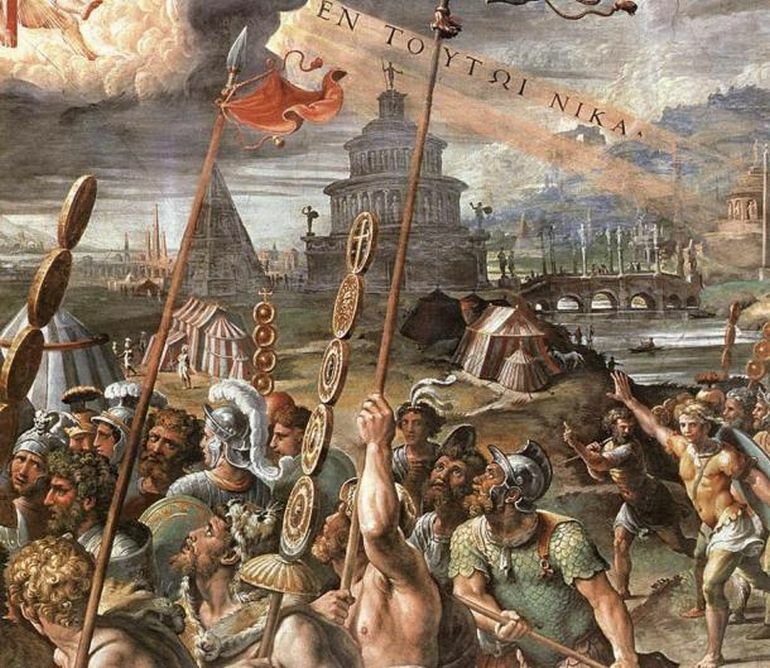 The ‘Vision of the Cross’ by Raphael (Wikimedia Commons).